A synthetic biology team at Tianjin University (TJU) has reported new methods and strategies for genome rearrangement and accelerated the evolution of yeast strains with their three latest studies published in Nature Communications on May 22, 2018. The publications are part of an effort toward the application of chemically synthesized designer yeast chromosomes. A collection of seven newly published papers had authors from seven universities in four countries, including Tianjin University and Tsinghua University in China, New York University (NYU) and Johns Hopkins University in the US, the University of Edinburgh and Imperial College London in the UK, as well as the University of Potsdam in Germany. 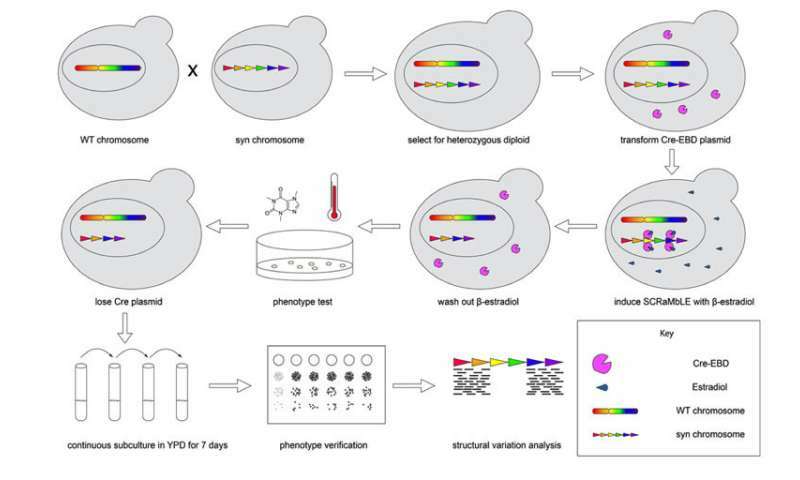 Designer yeast cells incorporating the Synthetic Chromosome Rearrangement and Modification by the LoxP-Mediated Evolution (SCRaMbLE) system provide a platform for generating genotype diversity. However, leaky expression of the Cre switch, high lethality rates and single strain backgrounds previously limited the application of SCRaMbLE. 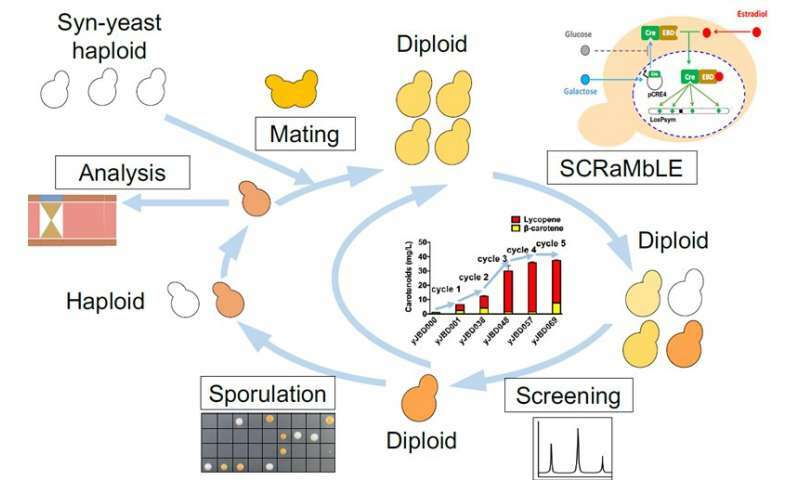 To overcome these challenges, Bin Jia, Yi Wu and collaborators have developed a precisely controllable SCRaMbLE system in synthetic haploid and diploid yeast. "How to control the SCRaMbLE process is crucial for organisms with specified advantages, because leaky SCRaMbLE decreases the stability of strains with fixed phenotypes", said Bin Jia, who has constructed a genetic AND gate based on transcriptional control of the GAL promoter and intracellular location of the estrogen-binding domain. This AND gate performed with higher reliability without observed leakage. As a proof of concept, the AND gate control of SCRaMbLE can increase the yield of carotenoids produced in synV yeast. "The deletion of large fragments containing essential genes in haploid yeast can result in loss of viability, potentially decreasing the diversity generated by SCRaMbLE", said Yi Wu, who came up with an idea to use SCRaMbLE in diploid strains. This strategy allowed the essential alleles in the wild-type chromosomes to remain intact and successfully improved genome diversity. Based on the precise control of SCRaMbLE in diploid strains, the TJU team developed a strategy called Multiplex SCRaMbLE Iterative Cycling (MuSIC) to increase the production of carotenoids up to 38.8-fold through 5 iterative cycles of SCRaMbLE. With collaborators from NYU, Yi Wu led the study of SCRaMbLEing in heterozygous and interspecies. In this research, they reported a collection of heterozygous diploids by mating synthetic yeast strains with native strains. "Such heterozygous diploid strains take advantage of the flexible genotype of Sc2.0 yeast and robust phenotype of wild type yeast," said Yi Wu, "this study establishes that SCRaMbLE can drive phenotype evolution in heterozygous and interspecies hybrid strains". 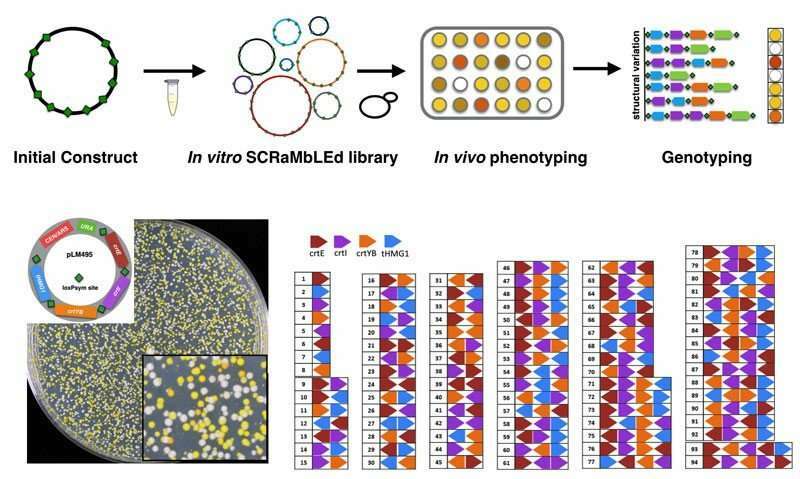 Additionally, Yi Wu, Rui-Ying Zhu and collaborators have developed an in vitro DNA SCRaMbLE technology for structural varied library construction and biosynthetic pathway optimization. "This system provides a straightforward way to correlate phenotype and genotype and a new strategy for biochemical optimization, it enables the acceleration of biological discovery and productive industrial microbe evolution", said Yi Wu. "The SCRaMbLE methods reported are potentially a powerful tool for increasing the production of bio-based chemicals and also for mining deep knowledge", said TJU Professor Ying-Jin Yuan, "it will prove invaluable for both academic and industrial applications". The findings are especially important, and TJU's synthetic biology team has started a new Long March towards accelerating genome evolution to improve human health, prevent and cure disease, provide clean energy and promote a sustainable environment.